We talk about wanting classes full of critical thinkers. I think this is a great goal and I am generally very high on empowering students to authentically think through complex situation. But it’s not all pros. Cons do exist. (Nothing… nothing… is all rainbows and unicorns.) Especially when you consider that critical thinking is a skill we are becoming more equipped to foster and practice, while discernment is a skill that is best taught by life experience and generally comes along much more slowly. So, we need to make sure that we are embarking up the critical thinking mountain soberly. The fact is that “critical thinking” is an easily-transferable skill set — this is why it is so attractive to us. But what happens when the students decide that they want to turn that critical thinking on you as the teacher? When our undiscerning young learners want to practice critical thinking in an authentic setting? Are you being fair? Are your instructional decisions reasonable? Did your grading of that test make sense? Your work becomes much more scrutinized when you have 25 sharp-minded critical thinkers on your journey with you. And with their lack of discernment that almost goes without saying (students don’t behave professionally), you are almost empowering smart alecks – on purpose. Let me give you an example of what I mean. This came out of a third grade class. One of those kids was a critical thinker. Interesting questions. Critical thinking questions. And for some teachers that would be a great question. For others, it would sound like the wonderings of an tangentially-on-task smart aleck. In reality, it might be nothing more than the mental overflow of a student who is really exploring a context they way we taught her to. And the context didn’t immediately make sense, so she asked a clarifying question. That sounds like critical thinking. But, in the ears of some teachers, the word “critical” is in bold. And while, I suppose, it is possible that the student was intending to be disrespectful, I think it is exceedingly more likely that she wasn’t. We wanted her to engage context. She did. We wanted her to think critically. She did. We wanted her to apply her answer to check for sense making. She did. In general, these are things you should be doing anyway. But, if you are properly fostering critical thinking in your students, you may find that some of the elements of you coursework that you felt were “good enough”, may not stand up to the scrutiny of 25 critical thinkers with still-under-development discernment and very little professionalism (as we understand it) looking to poke holes in it. Embrace that. The smart aleck in your room might well be practicing the skills that we want him or her to have. The trick is to recognize what we are looking at. They might be trying to be critical thinkers and apply their new skills. Take their effort. Analyze it with them. Teach them how. Model respect. And rule #0, is if the argument is going to work, the LISTENER needs to change his or her mind when you are done. That means keeping them with you the whole time. That means not doing or saying anything that will shut them off. So, if you are trying to convince your parents (or other adults) to change their minds, you have to present your case in way that won’t shut them down. Now we are talking respect, evidence, cool heads, eye-contact, word choice… That’s proof writing. That’s argumentation. That’s taking the smart aleck’s skill set and turning into functional critical thinking. 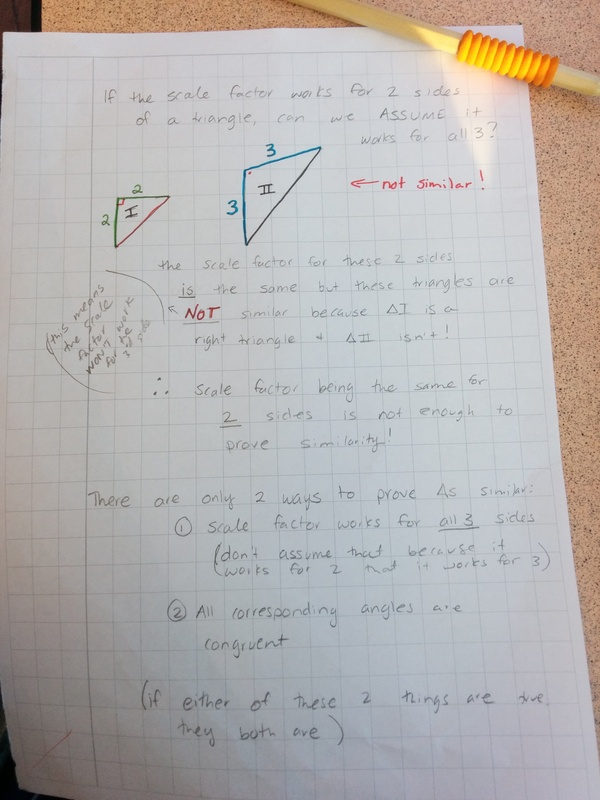 The moment I started to have success helping student really learn how to write proof in geometry was the moment I realized that”The Proof” is nothing more than a persuasive essay converted to math class. It’s disciplinary literacy. And thinking of them as mathy-style essays can help us isolate some of the reasons the students struggle with proof in general. My experience leads me to think that many of the struggles are the same the ones the students experience with writing outside of math class. They don’t understand the structure, they don’t appreciate the value of honoring their target audience, and they don’t understand the content well enough. Luckily for us, the ELA department has often hit those three points really hard. As math teachers, we just need to help the students bridge the gap. Who’s the target audience? In math, it’s often either someone who doesn’t understand or someone who disagrees with you. That explains why you need to back up each statement with theorem, definition, or previously proven statement. Take nothing for granted or you’ll lose your reader. And as for content? Well, have you ever read an essay from someone who plain ol’ doesn’t know what they are talking about? The best structure in the world isn’t going to save them if they can’t define the words they are trying to use. So, when it comes to proof-writing, I think we math teachers need to appreciate that “writing” really is at the core of it, and the better we make that connection explicit to our proof-learning students, the more likely they are to be successful. And perhaps there’s a role for some meaning collaboration between high school math and ELA departments. And with that, enjoy the latest “Instructional Tech in Under 3 Minutes” discussing, of all things, writing. I want to share a story that shows the power of an effective PLN. In a previous post, “proof and consequences: circular reasoning“, I begged for help solving a problem with students struggling to see their own logical crisis that was leading to predictable and consistent problems. Several people reached out to me with suggestions. Thanks for that. I would like to highlight one specific suggestion that I tried to today and it worked just exactly as the designer predicted. The suggestion was made by @nerdypoo. I loved this idea. And yes… I did. I did want that .jpg. So, here’s a portion of what she sent back. 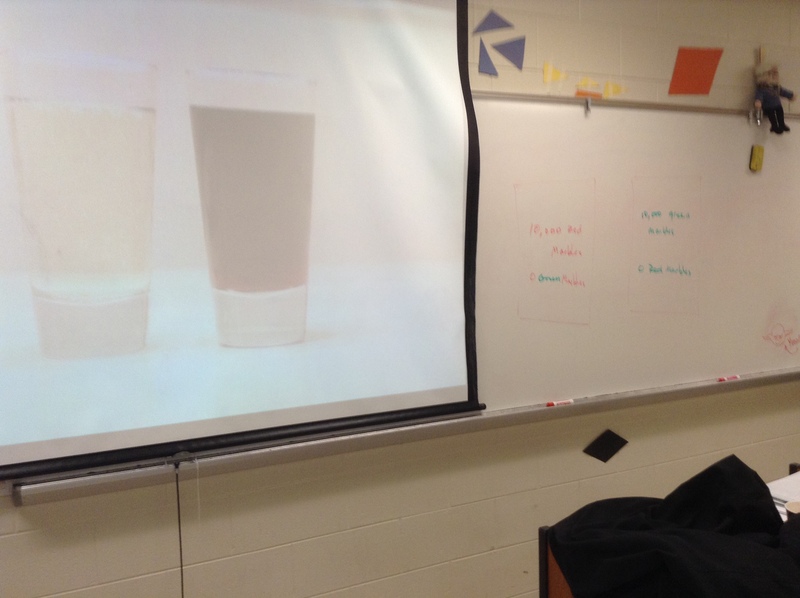 … and asking the students to vote on whether the triangles were similar, not similar, or we don’t know. Overwhelmingly most students voted that they were similar. 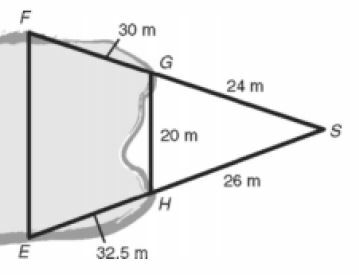 The thoughts they articulated were mainly that they could find the legnth of the missing side (which they claimed to be 3 cm long) and then could use SSS to show a consistent scale factor. Then I showed them this image and asked them to vote again. A lot of votes changed. Many changed from “similar” to “not similar”. A few others changed from “similar” to “don’t know”. An additional piece of information revealed an assumption. 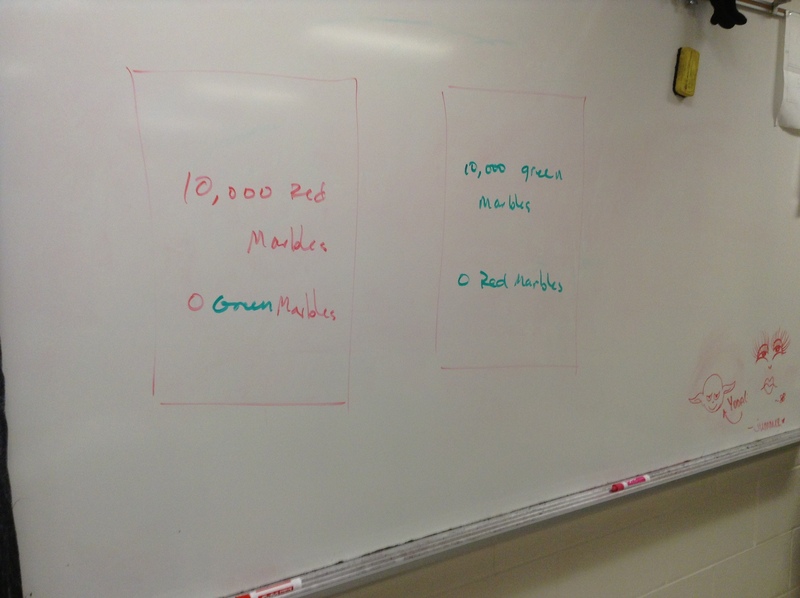 The assumption was that finding a consistent scale factor in two pairs implied the third. Perhaps an assumption that the angles were congruent. It was essential that I made sure the students knew that I wasn’t changing the situation from the first question to the second. I was simply revealing information that was hidden. Those angles were never congruent. They simply didn’t know that, but most them assumed they were. But every person who voted that the first two sets of triangles were similar were making an assumption, an assumption that they didn’t recognize before. An assumption that shouldn’t be made because sometimes it’s incorrect. I’m frustrating my students in ways that I don’t want to. I’m not sure exactly what to do about it. In geometry there’s proof. With proof comes a certain logical structure. Once you know this structure, it is terribly difficult to unknow. Currently we are dealing with similarity, which involves using SSS, SAS, and AA postulates to prove whether or not two triangles are similar. 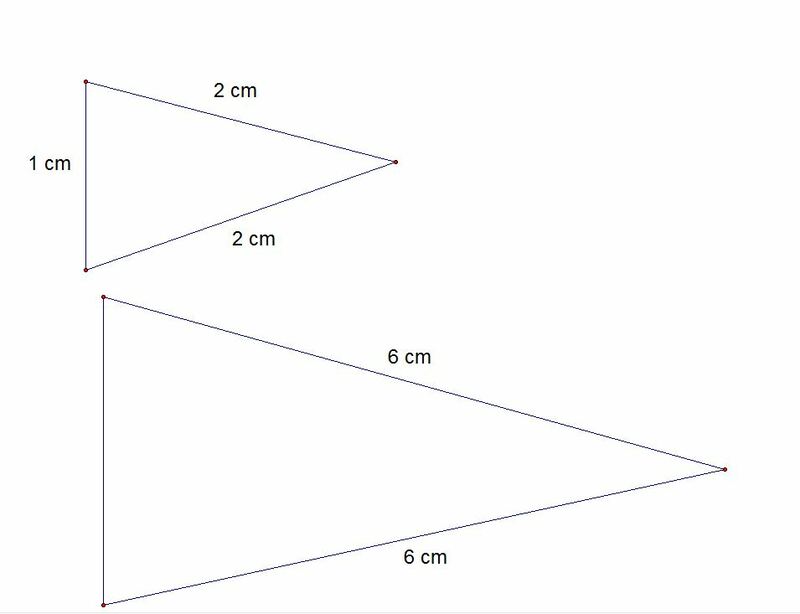 Suppose I gave this image to a student and asked them to find whether or not triangle FES and triangle GHS were similar. Let’s suppose the student divides 54 by 24, and also 58.5 by 26. Both times the student gets 2.25 as a solution. 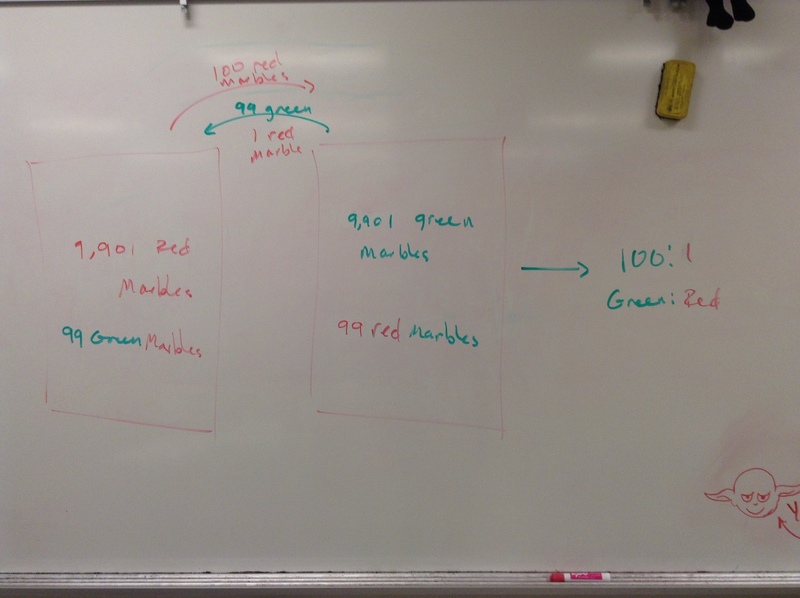 The student assumes this is a scale factor and applies it to GH, finding that FE = 45. The student then divides 45 by 20 and gets 2.25 for a third time. That’s three pairs of proportional side lengths and BAM! Similarity proven by SSS. The student assumed similarity before it was proven. Then proceeded to use the assumed scale factor to find the missing side length, which ensured that the third quotient was going to be the same as the first two. This is circular reasoning. They are similar because FE = 45. FE = 45 because they are similar. I have seen this play out countless times. I have addressed it with little success. I can’t seem to make sense to the students why that argument is weak. 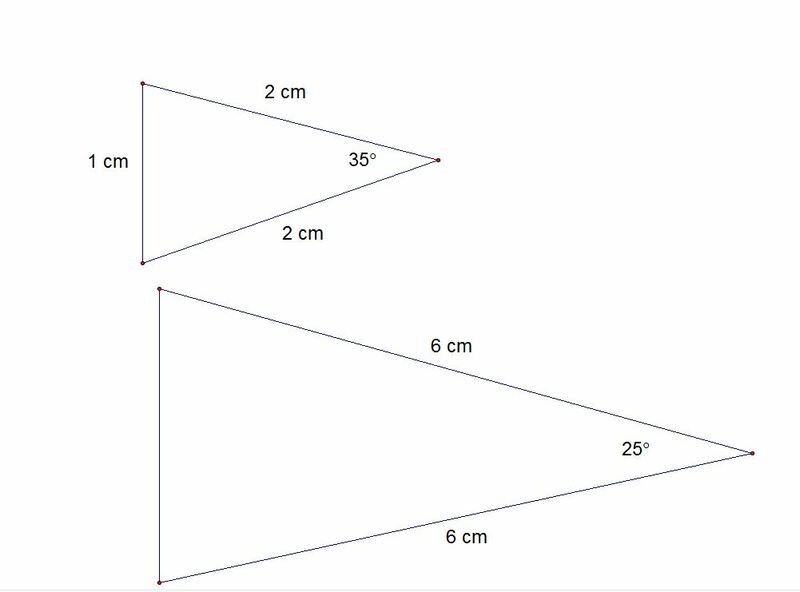 It sounds like “geometry teacher says we can’t, so do what geometry teacher says.” (especially when the very next question asks for FE, which is 45… because the triangles ARE similar…). I can’t stand using my authority as a teacher to enforce a math idea that the students are perfectly capable of actually learning. I’m trying to decide how picky to be with this. I have a hard time allowing that circular reasoning argument to be called correct, although it is clear that the student has learned a lot about similarity, proportionality, and the structure of a proof. I am hoping for some help on this one. I’ve tried a lot of things, but that thing you like that works really well for you… I haven’t tried that one. Toss it my way. I want to see how well it works.